I heard of the Kellogg's pop-up restaurant in Union Square in the city, and knew we had to go. Thomas' 4th birthday is Monday, and Sydney and I and our kids will always do a little something together for each of the kids' birthdays, separately from what else might be going on. The forecast called for rain so we suited up and got on the train for the city. Before long we were there, Kellogg's NYC. It's on the second floor of a building that faces Union Square, but there is elevator access on 18th Street. When we were there, there was a Mommy and Me type class going on in a back room. We went straight for the make-your-own cereal bowl. For $1.50, you can fill your bowl with any combination of dry cereal, including Froot Loops, Apple Jacks, Special K, Corn Pops, and a Limited Release pink, blue, and purple Unicorn cereal that was a lot like Froot Loops. 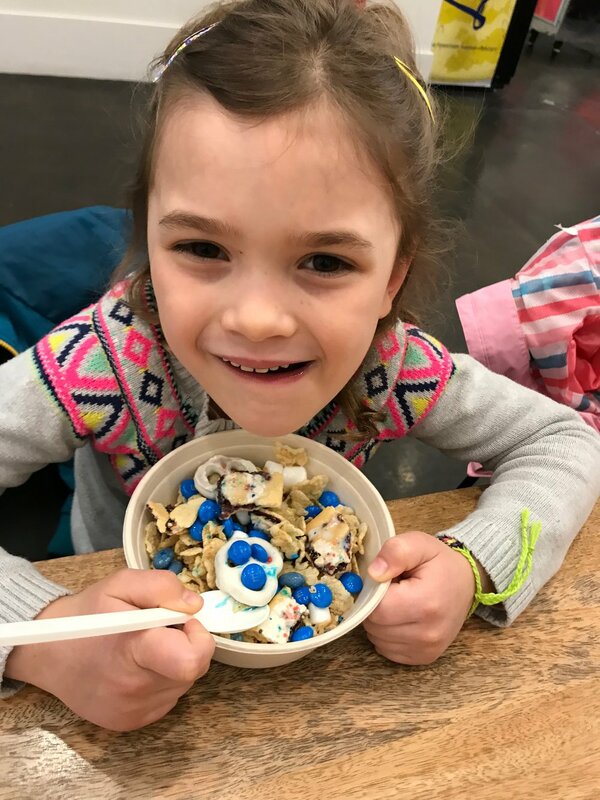 Or for $4, you can have cereal and unlimited toppings, including fresh fruit, M&Ms, marshmallows, yogurt raisins, white chocolate chips, etc. For $2 extra you can buy chocolate, strawberry or vanilla single-serve milk cartons. We let the kids go nuts. After they chowed down, they took off their shoes and jumped all over a bunch of nearby beanbags. On a Friday morning, there were lots of parents and kids in the back and no one seemed to mind. Sydney and I drank three coffees (free refills!) 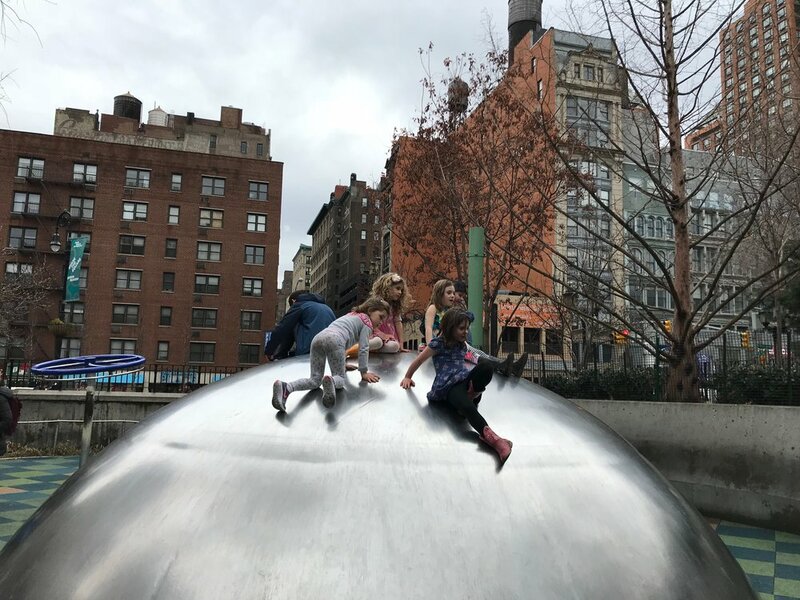 and then we took them to the Union Square playground to run off all that energy. Sydney and I took turns hitting the Farmer's Market for sunchokes and Martin's pretzels (me) and hard cider and apples (her). Stay tuned for recipe blog posts! It was the perfect little birthday half-day trip.